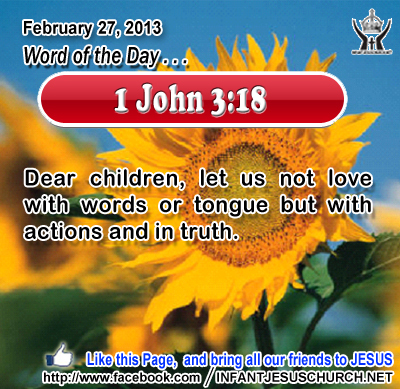 1 John 3:18: Dear children, let us not love with words or tongue but with actions and in truth. Heavenly Father, we confess to you that at times we are selfish. Other times our intentions are good but we follow through and faithfulness are lacking. Use your Spirit to empower and enable us to be what w hope to become to your glory. May your love be seen in our actions of genuine concern today. We pray this in Infant Jesus name. Amen. 17And as Jesus was going up to Jerusalem, he took the twelve disciples aside, and on the way he said to them, 18"Behold, we are going up to Jerusalem; and the Son of man will be delivered to the chief priests and scribes, and they will condemn him to death, 19and deliver him to the Gentiles to be mocked and scourged and crucified, and he will be raised on the third day." 20Then the mother of the sons of Zeb'edee came up to him, with her sons, and kneeling before him she asked him for something. 21And he said to her, "What do you want?" She said to him, "Command that these two sons of mine may sit, one at your right hand and one at your left, in your kingdom." 22But Jesus answered, "You do not know what you are asking. Are you able to drink the cup that I am to drink?" They said to him, "We are able." 23He said to them, "You will drink my cup, but to sit at my right hand and at my left is not mine to grant, but it is for those for whom it has been prepared by my Father." 24And when the ten heard it, they were indignant at the two brothers. 25But Jesus called them to him and said, "You know that the rulers of the Gentiles lord it over them, and their great men exercise authority over them. 26It shall not be so among you; but whoever would be great among you must be your servant, 27and whoever would be first among you must be your slave; 28even as the Son of man came not to be served but to serve, and to give his life as a ransom for many." The Lord Jesus asks every one of us the similar question he asked of James and John – "Can you drink the cup that I am to drink"? The cup he had in mind was a cup of sacrificial service and death to self – even death on a cross. What kind of cup may the Lord Jesus have in mind for each one of us who have chosen to be his followers? For some disciples such a cup will need physical suffering and the painful effort of martyrdom – the readiness to die for one's faith in Christ. But for several followers of Jesus, it entails the long practice of the Christian life, with all its daily sacrifices, dissatisfactions, set-backs, struggles, and temptations. A disciple must be prepared to lay down his or her life in martyrdom for Christ and be ready to lay it down each and every day in the little and big sacrifices necessary as well. An early church father summed up Jesus’ teaching with the phrase "to serve is to reign with Christ". We share in God’s reign by laying down our lives in modest service of one another as Jesus did for our sake. Are we ready to lay down our life and to serve others as Jesus did? Loving Infant Jesus, make us a servant of love for your kingdom, that we may seek to serve rather than be served. Inflame our heart with your love that we may give openhandedly and serve others joyfully for your sake.